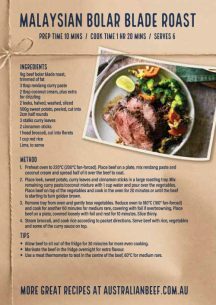 You can use our Harvey Beef Creations Salt & Pepper Roast in this recipe. Click here to see where to buy. Preheat oven to 220°C (200°C fan-forced). 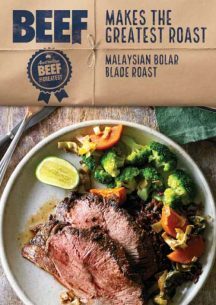 Place beef on a plate, mix rendang paste and coconut cream and spread half of it over the beef to coat. Place leek, sweet potato, curry leaves and cinnamon sticks in a large roasting tray. Mix remaining curry paste/coconut mixture with 1 cup water and pour over the vegetables. Place beef on top of the vegetables and cook in the oven for 20 minutes or until the beef is starting to turn golden brown. Remove tray from oven and gently toss vegetables. Reduce oven to 180°C (160°C fan-forced) and cook for another 60 minutes for medium rare, covering with foil if overbrowning. Place beef on a plate, covered loosely with foil and rest for 10 minutes. Slice thinly. Steam broccoli, and cook rice according to packet directions. Serve beef with rice, vegetables and some of the curry sauce on top. 1. Allow beef to sit out of the fridge for 30 minutes for more even cooking. 2. Marinate the beef in the fridge overnight for extra flavour. 3. Use a meat thermometer to test in the centre of the beef, 60°C for medium rare.